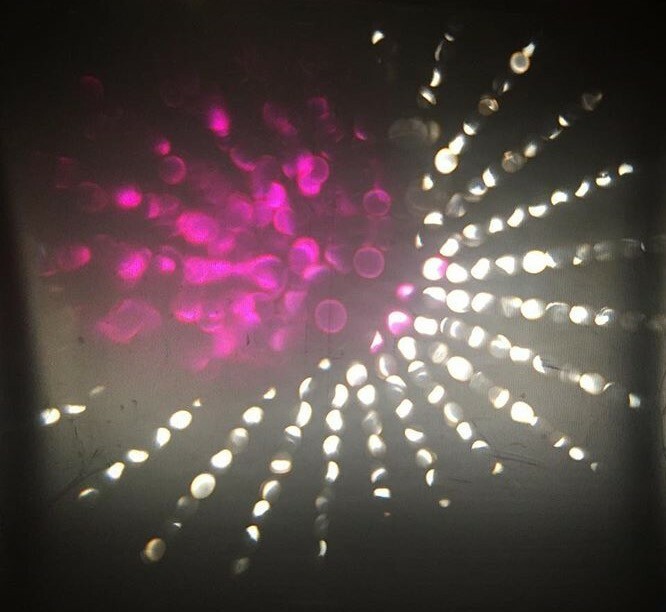 Hand-animated assemblage of refracted light projections, performed with multiple projectors and lenses, with live sound accompaniment by Marie-France Hollier. Her interests include early music, funereal doom, trauma theory, and the physics of sound and light. She has performed and presented work throughout North America. A meditation experience to unlock and reconcile with one’s past in an effort to imagine a future actualized self. Made possible with the support of PIX Film, LIFT and The Petman Foundation’s Studio Immersion Program. Leslie Supnet is a moving image artist who utilizes animation, found media, and experimental practices on film and video. Her work has shown internationally at film festivals, galleries and microcinemas including TIFF (Short Cuts Canada), International Film Festival Rotterdam, Melbourne International Animation Festival, Experimenta India, International Short Film Festival Oberhausen, WNDX, Edge of Frame/Animate Projects, and many others. She has been commissioned by Reel Asian, Pleasure Dome / Art Spin, the8fest, Cineworks, and Film Pop! (Pop Montreal). Leslie has an MFA from York University and teaches analog and digital animation at various artist-run centres, not-for-profits and for the Faculty of Art at OCAD University. Two video projections are divided into left and right audio channels. Transforming decaying video scan lines into a panoramic noisescape. Colby Richardson is a media artist and experimental filmmaker currently based in Winnipeg MB, Canada, working within installation, video-based sculpture, single-channel film and video, and expanded cinema performances. His work embraces the potential meditative qualities of abrasive and jarring stimulus, and investigates themes of transformation, escape, progress, obsolescence, and death. Colby has exhibited and screened work across Canada and internationally, including European Media Art Festival (Osnabrück, DE), International Video Art Festival Madrid (ES), Bideodromo (Bilbao, ES), SDUFF (San Diego, US), Antimatter (Victoria, CA), Microscope Gallery (Brooklyn, US), Videofag (Toronto, CA) MUFF (Montréal, CA), WUFF (Winnipeg, CA), Coaxial Arts (Los Angeles, CA), and Studio Kura (Itoshima, JP).